As part of my investment process each month I review the FTSE 100 using CAPE (Cyclically Adjusted PE) in order to project a ‘best guess’ of future returns for the UK market over the next few years. I focus on the FTSE 100 because that’s where I do most of my investing. If you invest primarily in another index then of course you should probably be looking at CAPE for that index. So where is the FTSE 100 today in terms of its CAPE valuation, and what does that suggest about the future? As I write the FTSE 100 is sitting just below its all-time high at 6,761. According to my figures that gives it a CAPE ratio of 13.3. That’s slightly below the figure I use for CAPE’s long-term average, which is 16, and so with a CAPE value slightly below average it’s reasonable to describe the FTSE 100 as slightly cheap today. That’s all very well and good, but so what? Cheap and expensive are woolly and subjective terms so I prefer to focus on what it could mean for future returns; and what it means for future returns is that they should be better than normal. The UK stock market has returned around 5% after inflation over more than a century, so a reasonable baseline for future returns is 7% in nominal terms, assuming the Bank of England keeps inflation at 2%. However, because of the slightly low valuation, a simple projection over the next 10 years suggests that a best guess for returns over that period would be closer to 9% a year. Dividends – with a lower than normal valuation, yields are higher than they otherwise would be and so returns from dividends are also higher. The FTSE 100 dividend yield today is about 3.5%. Dividend and earnings growth – CAPE has little or no impact on how quickly companies can growth their dividends and earnings. My assumption is that these grow at the historically average rate of 4% a year (i.e. 2% after inflation). Changes to valuations – With a lower starting valuation the change is likely to be positive rather than negative, adding to returns rather than subtracting from them. To return to a CAPE multiple of 16 the FTSE 100 needs to go up by an additional 20% or so. Put those together and you get a nominal rate of return of just over 9%, with the FTSE 100 standing at a smidgen over 12,000 in 2024. 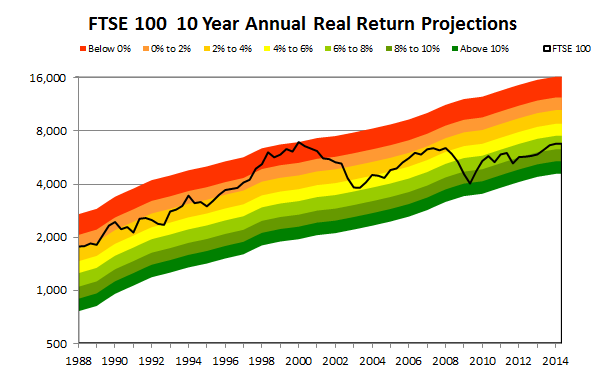 So, for example, in the late 1990’s the FTSE 100 was well into the top red band where projected real real returns were negative for the next decade (which for most of that decade they were). On the other hand in 2009 the index just touched the bottom green band, where future returns were projected to be in double figures, even after inflation (and again they have been so far). Today the FTSE 100 is in much more ambiguous territory than it was in either 1999 or 2009; it’s not especially expensive or cheap. Overall though I think the odds are likely that we’ll see better than average returns over the next decade. I sort of intuitively ‘know’ the markets are not over-valued but always good to see it represented in your graphics. Mind you, I think Personal Assets might disagree. They strongly feel the markets are over-valued and have been heavily invested in cash, gilts and gold (55%) over the past couple of years. I will be very happy when the ftse hits 12,000 in 10 yrs! Hi DIY, well I’d have rather been in the market than out since 2012. As for FTSE 12,000, a lot of people think I’m a bit nuts to keep mentioning those big numbers for the FTSE 100, but 12k is reasonably conservative number, it just looks like a lot given the decade we’ve just had. As the saying goes, people overestimate what’s possible in the sort-term and underestimate what’s possible in the long-term. If say the CAPE moved into red band would this affect your long-term strategy of one in one out? Might you then move to sell one sell one buy one etc (like when you were building up the portfolio – but in reverse!)? No, I don’t think it would change anything. For me CAPE valuations are more useful for asset allocation policy (ie. how much cash or non-equities you hold) and a general understanding of the risks of a market-wide fall. I’d expect that no matter what the market’s overall valuation, there would still be some companies worth owning where valuations were reasonable at the very least. Could you do a CAPE valuation chart for the FTSE 250. That group of stocks seems currently overvalued to me so it would be interesting to see if the chart gives the impression. And/or the Ftse 350 simply because that’s the main group of stocks you monitor. In general I don’t really see why the market valuation matters and you give it so much exposure. It’s the individual stock valuations that matter. I think the Ftse 250 is overvalued, because all the quality stocks I like are expensive ie high p/e or low yield. It’s mainly yield I go by. So out of interest why do you look at the market value so often and fairly prominently? The FTSE 250 is something I’d like to track CAPE for but I don’t have the data. What I can do is pull in the data from the FT site and that goes back almost 10 years now (I think). I’ll just have to assume the longer-term average is 16 as I do for the FTSE 100 as it’s a reasonable assumption. If you don’t see a FTSE 250 CAPE article within a month or so just give me a reminder. As for why I look at market valuations and why it’s a central part of how I work, I guess there are a few points. First of all I come from an asset allocation background, so my whole approach to investing is based on a combination of modern portfolio theory and CAPE-based asset tilting. I then adapted that approach to picking individual stocks. I also value the market because I think it’s important. Stocks are highly correlated with the overall market, and are getting more so over time thanks to popularity of passive index tracking. So if the whole market is overvalued then there is the risk of a valuation contraction, which would probably hurt most stocks, even undervalued ones. Okay so after the correction those undervalued stocks would be even more undervalued, but you would still have to go through the downside first. And a lot of people quite sensibly want to know what a reasonable guess for future returns is for the market, as it’s reasonable to expect market-like returns from your portfolio, rather than stellar outperformance. Of course we all think we can beat the market, but it’s good to know what sort of returns you might get if you can’t. And I guess for some reason I like crunching numbers and organising them into charts, so it’s fun. Perhaps I should get out more? Did you get time to do the CAPE for the FTSE 250? Just change the date in the URL. Using the Gordon Growth Model to backsolve for ‘k’ (investment return) also yields a similar figure. I get 7.4%/annum. A notional investment of 100 in the FTSE 100 today yields 3.4%. Assume dividends grow at 4%/annum (based on the CAGR over the last 10 years). Solving for k yields k=7.4%. Interesting to see this totally different approach gives a very similar answer to the CAPE analysis! They’re kind of based on the same assumptions in that returns come from dividends and growth and valuation mean reversion. The GG model is basically missing the mean reversion bit, which makes GG less useful in the short and medium term (0-10 years) where mean reversion can dominate, but in the very long-term (10-30 years plus) any mean reversion effects are likely to be outweighed by dividends plus growth, and so very long-run returns (and my projections) would converge towards the GG value anyway. 2. How have value weighted stocks performed versus the FTSE? 3. Would you recommend a few value weighted indices or etfs to track to get the FTSE returns with likely additional value and size biased returns perhaps? 2. It depends on the time-scale. If you mean over the long-term then there are various bits of research which show that high yield/low PE/low PB/low CAPE stocks outperform over time. More recently, and in less academic terms, I have no idea other than how my own model portfolio has performed, which has been somewhat better than the market, most noticeably in 2013. Hope you find some useful info in there somewhere! Also I notice you refer to a UK FTSE mean CAPE of 16, from where have you derived this mean CAPE value? My last data on this to Dec 2012 had a long term FTSE CAPE valuation of 12.8. This would imply there should be a slight reversion to the mean from the current 13.3 CAPE valuation ratio over coming years all else being equal. This is a somewhat contentious point! My understanding is that the longest-term data for what could be called the UK “all market” index (as the FTSE All-Share only goes back so far) is something like 11 or 12, from memory. I don’t think that’s credible for mean reversion purposes in today’s stock market. The valuations from many many decades ago relate to a far less active market and I cannot see 12 being the average CAPE over the next 50 years. We only just got below that level in the depression of March 2009! So, what value to use? There is no good answer, but there are various reasonable answers. The UK market has an average CAPE in the high teens over the past 20 years; the US market has an average of around 15 or 16 over a century; International markets have a combined average somewhere in the mid teens according to Meb Faber’s team ( http://papers.ssrn.com/sol3/papers.cfm?abstract_id=2129474 ). So I currently use 16, although I could use 15 or 18, it probably doesn’t matter that much in terms of improving asset allocation or returns forecasts. There is too much noise in the stock market to make such accuracy useful, but back to the point – I think the mean UK CAPE over the next century is more likely to be in the 15-20 range than the 10-15 range, but trying to be more accurate than that is probably a waste of time. This is my first post to your estimable site. My question relates to asset allocation: for each of the seven bands of your analysis, how close to being fully-invested in equities might a long-term investor aim for? 100% at one (green) end and zero at the other (red) might seem ideal. However, there must always be some uncertainty. So selling off everything as soon as the index gets into the red would see, shall we say, rash. Likewise, retaining no cash at all once you touch “very cheap” would mean being unable to take advantage of further individual opportunities to make good purchases. % cash	10-year projected return p.a. The mechanics are slightly different but basically the idea is the same. However, going from zero to 100% is much more of a swing than most people are every going to contemplate, so I thought something less frantic might be in order. Ben Graham mentioned a couple of times of moving between perhaps 25% in equities when they were expensive to 50% when they were at fair value to 75% when they were cheap. The non-equities could be in whatever you like, such as cash, bonds, REITs etc. I’ve taken that approach and merged it with my valuation bands and if you have a look at the table in the article it has a “Ben Graham Equity Allocation” column, and that’s basically what I think is a ballpark sensible figure for somebody who’s looking to hold UK stocks as part of a multi-asset class portfolio (I’m pretty much 100% equities all the time personally). So at current valuations, if I were looking to balance stocks with other asset classes I’d have about 60-70% in equities. (and I fixed the formatting issue you were having a problem with by using the “pre” html tag). % cash  10-year projected % return p.a. which was intended to relate only to the cash/shares dichotomy, (i.e. wealth that you might put wholly into equities if you felt that the state of the market was sufficiently attractive). Just as a matter of interest - you say that you are now pretty much 100% equities all the time - was this also true around the year 2000? Yes, unfortunately, but 14 years ago I had no idea what I was doing. I was a 100% stocks for the long-run investor, passively investing in the FTSE All-Share and nothing else. That was fine in the 90s, but then we had the dot com crash and that’s what drove me out of passive investing; I wanted to understand what happened between 2000 and 2003! I’ve been more or less 100% equities since 2004/5 when I got back into the market as a stock picking rather than investing in funds. Hmmmm, so the UK Cape will in future be at higher levels cos these times will be different, eh sorry but can’t agree with your logic there. Also you mention the Cape being higher over the past 20 years, but much of that was probably due to the over valuation associated with 2 huge equity asset bubbles around 2000 & 2007. Also, I don’t follow your logic that whether you take the mean cape to be 12 or 16 does not really matter, as Cape should only decide Asset Allocation…… I totally disagree with this logic, as in fact AA is what decides the likely risk profile of your portfolio and it’s likely return range, therefore it’s critical to have a relevant mean Cape to allocate assets according to where one may find value! ?